You are here: Home / News / Nintendo NES Classic Discontinued: 4 Things Nintendo Switch Can Never Replace. Nintendo NES Classic Discontinued: 4 Things Nintendo Switch Can Never Replace. 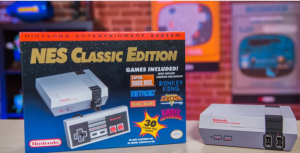 (ThyBlackMan.com) It’s sad to see that Nintendo NES Classic will no more be available in the market. The availability of the console is already scarce, but after the recent announcement by the Nintendo of America, the company will no longer produce the game console. Without giving any reason, NOA simply made an announcement, but it is clearly visible that Nintendo doesn’t want to take away attraction from Nintendo Switch by continuing NES Classic console. No matter how advanced technology Nintendo Switch offers, Nintendo NES Classic will remain irreplaceable on many fronts. The advanced cinematics and animations look stunning and more engaging, but the appeal of classic retro gaming is matchless. By discontinuing NES Classic, Nintendo is somehow killing retro gaming which will never be replaced by the next generation consoles. However Nintendo Switch houses many classic games as well, but the price tag makes a whole lot of difference. If people don’t get a cheap Nintendo Switch alternative, the retro gaming will go out of reach for many. It is no surprise that NES games have connected a large number of gamers. The entire generation of Nintendo games was being offered preloaded in the 30 games with NES Classic. No matter how good Nintendo is doing with Switch sales, the company cannot convince the entire generation to go for Switch or Wii U.
Nintendo is trying hard to make sure its new console remain flawless. The company has even started a campaign to make Nintendo Switch safe and hacking-proof. But at this point of time when the NES Classic is discontinued, Nintendo is playing with the trust of its customers. What people are feeling now is that Nintendo is not interested in listening to what they want. The affection for the old games is being neglected. Nintendo is trying to bring back the magic of Mario, Zelda and other franchises, but licensing many old games can be tough. As a result, you will never be able to experience many old games on the new consoles. Recreation to bring back these games is quite impossible in many cases. It is not because the games are really hard to develop, it is because the classic NES games are more about the experiences users have had. Those experiences can never be replaced by Nintendo Switch and its successors. Speculations on the company’s next steps are at peak. Some reports claim that Nintendo will do everything possible to protect Switch and this is one of the steps taken in this regard. Chances of the comeback of Nintendo NES Classic are scarce but they exist. Hey Nintendo, are you thinking of bringing the console back sometime during holidays 2018? Nintendo hasn’t officially confirmed that whether this cancellation is temporary or permanent, fans hope that the company will take its decision back. There are many people who have pre-ordered the console long back, but they are still struggling to get the package delivered. Due to high demand and less supply, many interested buyers spent a lot more than the console’s actual price to get it. Ultimately, the love for Nintendo NES Classic has led many people to file a petition. On a website called Change, there is a petition by NES Classic fans who want Nintendo to take back the console’s death warrant. With countless reasons, fans are telling Nintendo to hear them so that a generation of gaming can be saved and people will be able to show their kids what they used to play in their early days. No matter what Nintendo has planned for the future of its consoles, the memories, joy and happiness of waiting for and finally owning a Nintendo NES Classic console can never be replaced. The good old days. This generation knows nothing about Super Mario Bros, Donkey Kong, and so on. I’m loving my “Nintendo NES Classic”. Also “Nintendo” Switch is a must have.